This entry was posted in More Info and tagged contest, thrill of the chase, Treasure, Treasure Hunt by dal. Bookmark the permalink. Great idea, I’m sending mine in now. Speaking of Forrests Memoirs, has Too Far To Walk always been advertised as “A Hinting Memoir”? I never saw the words ‘hinting memoir’ . Anyone? Forrest has said that you can find the chest using just the book, the poem, & google earth. Hope that helps. I noticed the Hinting Memoir a week or 2 ago as well. I believe it is new. That should throw a stick at it! thank you for responding. I think it is significant that the wording has changed. I have every intension of purchasing Once Upon a While. This is the first time I have ever seen a direct reference to hints in Too Far To Walk. Dal, can you comment on whose decision it was to alter the wording? Did Forrest recently tell you its a ‘hinting memoir’? Forrest hiding indulgence on a rock, by a waterfall, in the Rocky mountains, with a bear. I really like yours, Michael! Because it has My Grizz hiding behind a tree, watching Forrest hide the bronze chest, in it. Good luck searching for the trove! Love this idea. Will have to give it a shot. trick or treat!—mine is finished! I’m so happy that it will be a stick figure. Enjoying the imaginations of the stick figure artists. What if my stick figure is obese like the artist? Stick to the plan. Hmmm -a stick chart of sorts. Cool. Getting ready to scan. Dang!! I haven’t been practicing my stick figures. Wouldn’t you just know it! Knock the dang banana in the head, wantcha!!! Mine is in. That was fun! I look forward to seeing the rest. Tell people you discovered that fact and use it for your solve. Go ahead. Wow, some you chasers have got some artist skills. I was not granted that talent so now I would not even vote for my own, but I do like chaser- ……..a lot. The entries are filling up. The competition is stick…I mean, stiff! Mindy, where can i find secret carpark comment by Curious hobbit? Oh Darn Mindy, I thought the lack of tails was a hint that Fenn put there. Hey Zap – what are the odds of 2 cows appearing in a drawing without tails? Just maybe those cows are a hint. 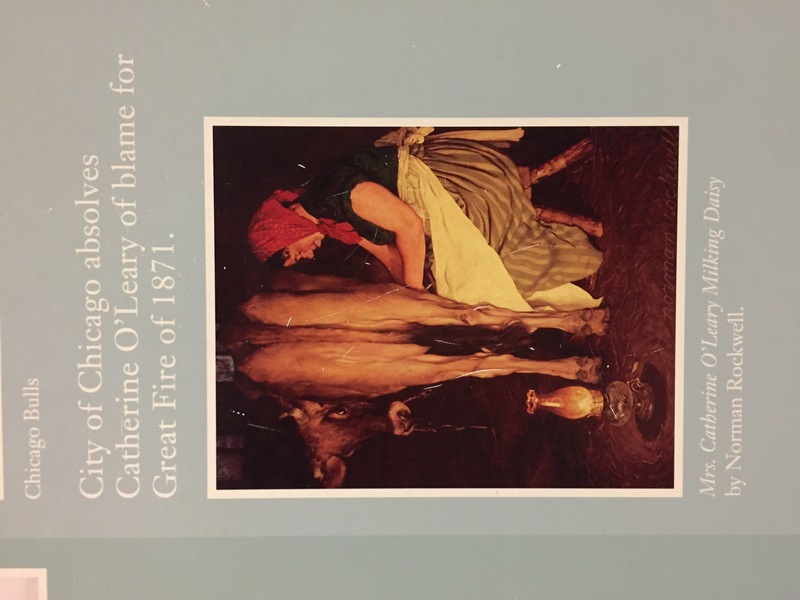 In TTOTC book the drawing of Forrest milking the cow humm…..
Catherine O’Leary Milking – could the story behind the painting be part of the hint. Well we already know most of the drawings in this book are copied from Norman Rockwell Paintings – are they hints too? Like Rockwell’s – No Swiming, Facts of Life, Over There, the Problem We All Live With, and there is a few others. If you haven’t heard this then look in the book at the drawings and compare with these paintings. But there is one of Rockwells paintings that if I didn’t know better I would believe it was Forrest’s family on the way to Yellowstone ( especially with the name on the boat). Thanks Mindy, for bring back memories of some fun discussions. Just in case you would like to match other drawings in the TTOTC book here are a few more Rockwell paintings to compare them with. First Down, The Gossips, and Madison Moyle. There are two more I just don’t remember the names, have to look back in my paperwork when I get home. Good luck all. We can just play pin the tail on the ‘cow’ then…. :) Love the thinking Fenn….. I love the rabbit nose! I had a lot of fun with hidden meaning in this drawing. I’m not sure about the rabbit nose…but I think you might be seeing where the two T’s in TTOTC meet. The drawing was done inside the Letters TTOTC. Each frame is a letter. That’s cool you saw a rabbit though…I see it now, too. Yes I am aware of the graffiti type art there spelling TTOTC. I think it’s really cool. The rabbit’s nose also jumped out at me, intended or otherwise. Ask yourself a question. Or ask Fenn. How many rabbits have hopped past the treasure chest? I have enjoyed looking closely at the pictures. Not unlike the poem, attention to detail reveals so much more. I am just now seeing that Amanda has words in her picture………yeah, I know I’m slow. Sometimes the brain takes the scenic route! Dal looking forward to more tonight. These all look awesome. I’m going to have to make one too! Is there still a book signing in November? This is fun! It’s amazing to look at all of the different styles in these entries. Very intriguing and quite a lot of talent. Just put in my entry. Thanks everyone for a good laugh. Wouldn’t it be cute to have enough drawings to make a small cartoon book of the the Chase. What would be a good tiitle? I vote for “Draw your own conclusions”. lol. That’s good! A slight modification to JDA’s suggestion. How about “Stick to Your Own Conclusions”? I like that too! Somebody, make a book. Just think we’ll all be remembered…….hey, Lou Bruno are you there? Jenny, how about you? You are published, you know the ropes………somebody needs to run with this. It’s just too cute. Oh….Draw your own conclusions—lol… that’s brilliant…. @BW re small book from this contest….darn near half way there…lol! I vote Jeremy P edit! BW – Eric is included in my Blaze, high above my spot. So he can see it from the clouds, I am sure. And I am also sure that Forest hit the bronze chest in during that Summer before he turned 80 because of Eric. I would post a Double Omega here, but I don’t know how to do that here on my phone. This is such a fun contest….thanks Dal for providing it… I need to get my stick pens out…..
🙂 I’m sure it’ll be GOOD! Everyone has always enjoyed your work, Jeremy. You’re a very talented artist. Jeremy P, how did you so that? Too cute! Frame by frame animation (I’m a bit of nerd). Haha! Nice work, Jeremy P! Love it! They’re all great. I’m really impressed but not to surprised at how many creative individuals there are in the Chase. This is a great contest! I’m having so much fun looking at everyone’s creations. It is fun! They all are so great! I better go sharpen my sharpie. Jeremy P. I’m laughing out loud. That’s what I feel like when I’m searching. Too funny. Lisa Cesari’s captures the true heart of the matter. Brilliant. aardvarkbark – You get me. I attempted to channel Eric Sloane doing one of his excellent Pen & Ink drawings, because I cannot draw. I tried doing three previous drawings before that one to re-prove that fact. They were really, really bad. Colomtnman – I am pretty sure that is my blaze on the mountain top behind Forrest’s left leg in the shot at the top of this page I know just where he took that on the 205 trail above my spot.. He doesn’t mention the camera or Donnie taking this picture in the TTOTC book version, That is one of the differences I noted from the original article I posted above. What better place to hide the bronze chest, than in a landscape that Forrest describes himself in this way? – & Dumbfounded thinks it’s ok to park in a disabled carpark, forever!! Careful how you critique, some might think your rendition is way out there, fishing, playing loud music with a deer near by…. You don’t need a license to fly a washing machine, besides, my other car is a JEEP. This artwork is fantastic. I believe we could auction these off for millions of dollars. So creative. So awe-inspiring. I am hyperventilating as I gaze upon these masterpieces of ingenuity. Be still my beating heart. I need to stop for a moment and regain my composure. Good God am I impressed. You must all be truly amazing people. I can’t believe that I, an art crtitic, am say this. But I truly am absolutely astonished at the craftsmanship involved here. I am deeply moved. but I’ll bet the stick pic drawn by the finder of the chest might bring as much as $1 a square inch! Nice! If Reginald D. Sotheby III is an art connoisseur & dealer, do artists need to stipulate how they get paid and not in Monopoly money? Covert One: I resemble that remark. Fine but not too fine. You should submit one, its fun! I’d be very happy (and surprised) if I could get a rock-bottom price of $17 a square inch. We are surrounded by many creative and talented folks. A few could and should hold-off for a higher price. Of course, we’d need to find someone who knows something about the art business. Any suggestions? With a name like yours, could it be you? Thanks. Oh, forgot one thing. We are. I love your cartoon. Lots of cute details. Thanks for submitting. “Is that sage I smell? – cute – cute, but this one line I can’t make out. I think it says “Creek goes underground” if I’m not mistaken. Wow, some really great drawings. Finding stickman art, here, very interesting! If you sent a contest entry but don’t see it posted, please let me know..
Like looking at funny Indian Petroglyphs. Lots of imagination in all the entries. Put mine in, I love all of them, each so unique! I agree jdiggins….. a lot of great artwork…. Nora: Like your creativity & imagination. Or is it your knowledge based on what I see using GE or GM and zooming in on Continental Divide Trail & North Fork Buffalo River near North Fork Meadows, Teton County, WY at 43°56.45N 110°12.40W. Best of luck. For those of you with young children, here is a contest for them. Dal hope this is ok to post. This is a great contest to get the imagination going, & it’s so fun to see all the ideas put to paper. Hope more come in to view before the closing date. Spallies, your entry is awsome! Spallies, I hate Monopoly but your Fennopoly looks kind of fun. I’d play a few rounds of that. Did you get your patent already? Fennopoly has my vote! Very creative and original. Way to use your imagination! Luxury of warm water indeed. And all this time I thought Goofy was a Dog… he’s an old biddie LOL. Clever Spallies… But ya got some heavy competition, Jeremy’s home made movie. I don’t care who wins. I want to play Fennopoly! I’m looking through the entries, trying to find names I don’t recognize, thinking it might be Forrest dropping a hint. And going crazy. So many awesome entries though. My favorites are 1.) Madesquare – for the sheer simplicity of the idea, & the drawing. 2.) Blex – for the wry humor exhibited in the drawing. Both struck my sense of humor. I really like the creativity on Stephanie’s entry on page 7! She tore up more ground at one point than most. Add to my favorite list: 3.) Randawg – for depicting the serenity of being in the wild by yourself. The drawing is peaceful, & you just know Forrest is enjoying the hike. What a great little contest 🙂 Than you Dal, for all you do,,,,but where is your entry? Great job everyone! I love them all. I think Spallies needs to be ejected from this contest and given a contract by Parker Brothers. Can I just buy a bullet trinket? It would probably be surprising to know how much I searched this summer. …and how much is that Stephanie? I was home one day out of 137 days straight to date. Nice to have to evacuate your house from a hurricane when you’re already a zillion miles away. First search my daughter has ever come with on which was nice…but scary trying to get her out and hoping you don’t lose everything. I got so lucky. Does that mean your family is all okay and so is your home? Well…sort of, yes. Still married. 5 days before divorce was to be final he dismissed it and now we’re starting all over…but at least I have medical if I stub my toe on the chest. Thanks for asking. Hope all is well by you. Very creative entries! They’re great! Oh my gosh! I love everyone’s sketches! I have no doubt the judges will have a hard time choosing. Please get your entry in…only a few hours left. Contest closes at 11pm (mountain time) tonight. I tried emailing mine to you, but it was rejected with an error message. Was your fenn stick figure anatomically correct? It looks like some people’s mountains are the Grand Tetons. There are some good possibilities to look into there, in my opinion. – these made me laugh so much! my goodness – you are all so funny! Cool Beans! Best of luck to all. Citrusavenger & DWRock, Wow!! Both of your sketches are great! The competition just keeps getting better! Honestly, i think Rock’s is the winner..
Fenn fly fishing the Rockies Rocks! ummm, wait a minute there Spallies!! – who exactly is that poor searcher behind bars?! (Dal – is it just the imminently bitterly cold winter? what is under the the first chance card… I always try to peek first be for drawing the top card… OK OK, so I wanted Broadway, and Park Place who didn’t? That’s OK Bert, some folks have never heard of Endor. Spallies – what’s “Australia”?? – nope, never heard of it!! and even if it DOES exist, by some miracle, ya def don’t wanna visit that place ..it’s over-run by rabid wombats!! I don’t envy the judges. Tho 4.) Citrusavenger & 5.) DWRock have been added to my faves list, looking back on the earlier entries i better not be declaring who i think should win. Dang they are all so good. Thanks, Dal, for the contest. It’s was fun! Your entry caught my eye… I can’t tell if it’s a drawing [sketch], ink pad lay overs, dotted, computer generated… but at first look it just caught my eye as if an old black and white photo. Might you explain how you did this? Just curious. Dal congratulations, looks like this was a popular contest. Eleven pages of great imagination! It was fun. Thanks. Ready for the next one. I had as much fun with the contest as I have had out searching. Thanks for giving me something to do related to something that I have become very passionate about. Thanks for creating the contest ! Just looking through all the great entries.Judging will not be easy. Wow @ how many great entrees! Who are some of these people, lol. lurkers we got you now! lol, imo! Sorry,,,I have to postpone the date that we announce winners until Friday October 27th. I was unexpectedly pulled away from my computer for two days.